Making your own pie not only tastes better, it is just about as easy as buying one and slightly cheaper. Preheat the oven to 425. It should be ready about the time we are. Be sure to take the pans out of the oven first if you're at your mom's and she likes to store things there. Buy some of the rolled crusts in the refrigerator section of the grocery store. Grease a 9" pie tin (the disposable aluminum ones work well) and gently form the crust to the inside of the pan. Pinch the edge of the crust into a scalloped shape so it hold it's form. 2 cups pureed pumpkin. I usually use real pumpkin, but a 15oz can of puree will do in a pinch. Toss all the custard parts in a bowl and mix well. Experiment with the spices. Some people also add nutmeg, cloves and other seasonal spices. You can also buy "Pumpkin Pie Spice" already mixed. Alternately, leave all the spices out and just sprinkle a lot of cinnamon on top of the cooled pies before serving. Continue mixing the custard parts and add the spices slowly to avoid clumping. You should now have a thick soup. Pour the soupy mixture into the crust. Fill to about 1/4"-1/2" of the top and carefully put it in the oven. 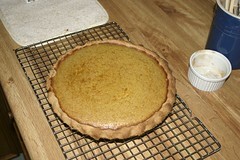 To use real pumpkin just buy a couple small pie pumpkins. Slice them in half and remove all the stringy bits in the middle. Microwave in a covered pyrex dish with a little water until mushy. Let it cool enough to touch and scoop the meat out with a spoon. Puree the meat and use the same as the canned stuff. Bake at 425 for about 20 minutes, turn the oven down to 350 and bake about 60 more minutes (+/- 15 min). The pie is done when a knife poke into the custard comes out mostly clean. The pie will firm up some as it cools. Let it sit for an hour (or more) and enjoy warm (or cold) with whipped cream. You can make 2 or 3 pies in the same time it takes to make one. One 15oz can is close enough to 2 cups. It is very hard to over-cook just don't burn the crust. Even undercooked it still tasted great. You can protect the crust for the last half of the baking by making a shield of tin foil (or buying one already formed at a kitchen store). Just be sure not to cover too much of the custard or it will take longer to bake. I'll be sure to post a review and link to some pics when I get it.